At the tender age of five years old, my sweet daughter received a marriage proposal from a peer who was equally sweet. Already wise beyond her years (her name means “wisdom,”) and not wanting to crush her dear friend’s little heart, she replied “I’m keeping my options open.” Well apparently, when it came to the tactical system or formation that Inzaghi had to choose tonight, he also wanted to keep his options open. He lined up a 4-3-3, but with lucky Bonaventura intentionally inserted and able to push up and Menez moving to the center to switch midgame to the 4-2-3-1, kind of like he did vs. Juventus. 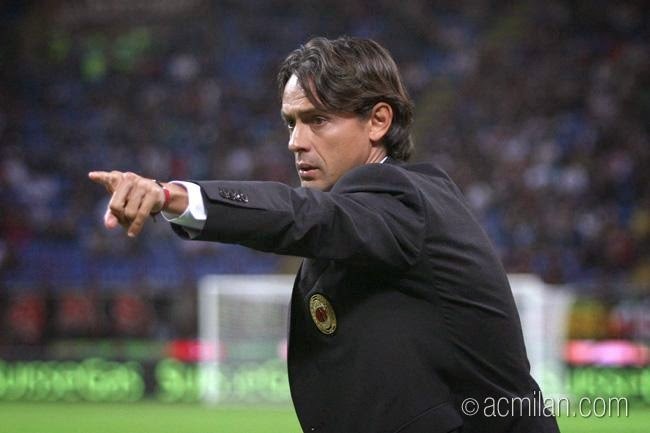 So by not making any set decision, the team eeked out the win and allowed Inzaghi to continue keeping his options open. The game was one that was hard to write about. On the surface, many called it “boring” or a “snoozer,” but if you look more closely, there was more to it than that. Like Milan taking 22 shots, but with only four on goal. Or 25 fouls for Chievo, 10 for Milan, and seven yellow cards, including cards for El Shaarawy and De Jong (and I think I heard that we’ll miss De Jong vs. Verona, so that’s not good at all.) Sure, Milan dominated possession, with 67% to Chievo’s paltry 33%, but Chievo still managed ten shots, with two of those on goal. And there were mistakes. Oh, so many mistakes. Just no conceded goals, so Milan’s first competitive clean sheet since the 1-0 derby win last April. Perhaps this game would be better characterized by the carnival-like atmosphere Milan attempted to create with the Milan Village and pregame entertainment at the San Siro, such as a football freestyle show. It seems that since Galliani cannot get it together and sign players that are entertaining enough to draw a crowd, Barbara Berlusconi will drum up the entertainment for him. Someone’s got to fill the San Siro. And games like this are not going to get that done by football alone. "I made the most crucial errors, but I also secured my starting spot with a goal. Yes! Bow down to me!" Having no Bonera again was refreshing for many fans, as despite Inzaghi’s defense of him through words, Alex and Rami were the manifestation of the manager’s trust, and both did well to keep it, hence the clean sheet. Coincidence? I think not. 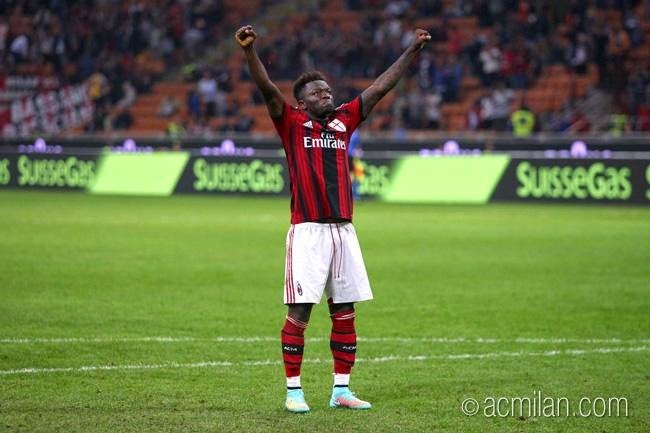 However, the first goal was a brilliant 54th minute volley from Muntari, 1-0 Milan. So yes, the Ghanaian killer not only started, but secured his place in the starting lineup until he gets suspended or actually kills someone. This is the least excited I may have ever been about a Milan goal ever, despite the fact that it was arguably a great goal technically. One mindboggling thing I didn’t understand of Inzaghi’s “options” was the starting and playing of Menez when he has had niggling injuries and fitness worries and was doubtful for this match. Especially with El Shaarawy on the bench. It was his introduction to the game and speed that troubled Cofie and forced him to give up a stupid foul which led to the beautiful free kick that Honda scored from in the 78th, 2-0 Milan. 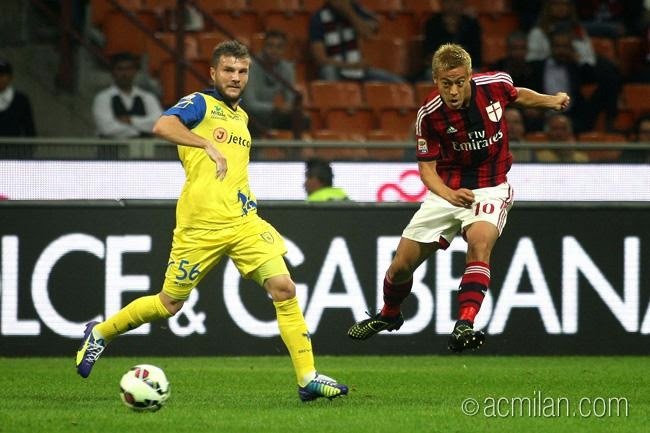 Honda is now Milan’s top scorer, the best way to shut up all of those people who doubted him since he made the move to the club. The man is indispensible for the team, and refuses to stop scoring goals or making assists. I love him. Inzaghi’s subs were late, El Shaarawy introduced in the 76th for Torres, Poli finally let loose in the 80th in place of Honda, and Muntari going off in the 88th for Essien. With all of the frustrating runs and dozens of fouls, it seems like he’d want to protect our players a bit more. The only reason I can think of to omit El Shaarawy and Poli would be for their national team callups that came just before the match. Except that El Shaarawy was not called up. And Bonaventura and De Sciglio played all 90 minutes today, despite being called up. Honda is traveling around the globe to play for his national team and still played 80 minutes. So no, it doesn’t make sense, and I really, really want to still like you Inzaghi, so I hope you sort this out soon. This is not the kind of option you can keep open with me. He can make me mad with his choices and still win me over with his Fondazione Milan bracelet. Three points is what I take from this match. And the growth of being able to change systems and adapt midmatch is a skill that I like seeing developed. But we missed some grinta, not enough tackles for my liking and too many wasted shots on goal. I know this is a growth period for the team, and I should just be grateful we didn’t let the 15th place team score and take the three points. But I like to watch good football, too. I don’t really care about Milan Village or the pregame entertainment, I want to be mesmerized by my guys in red and black every week. And I am starting to believe that this is a team that might just be able to do that for me. Hey, look at that. I just wrote something kinda hopeful. Sure, I want good football, but I’ll take the three points gratefully. I’m keeping my options open.